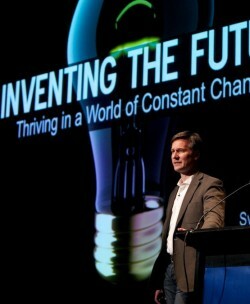 With more than 25 years’ experience creating new services around the world, Robert Tercek is uniquely qualified to address the subject of transformation and innovation in the information economy. He speaks directly from his own experience and the lessons from role models who inspired him, and he provides audience with clear examples and suggestions to apply in their own ventures. The following are a selection of topics from some of Robert’s most popular recent speeches. Please note that Robert creates new material and a custom speech for every speaking engagement. Today, massive change is a permanent feature of the business landscape. Mature businesses are under pressure to evolve rapidly, and new startup ventures face a throng of global competitors. In this popular keynote speech which is constantly updated with new information and examples, Robert Tercek shares five proven strategies for identifying opportunity in a chaos field, motivating a team to unite around an inspiring vision and how to execute what was previously unimagined. Tercek explains that it is no longer sufficient to respond to change: every leader must anticipate change, seek it out, understand the dynamics that propel it, and seize control and drive change. The best way to thrive in the future is to take an active role in its creation and evolution. Throughout his career, Robert Tercek has invented the future, and he can teach your team how to do it, too. The most significant change in our era is the shift in control from producers to consumers. Every company must now contend with an audience that is empowered to speak up, organize, and take action. Is the activated audience a threat or an opportunity? For Rob Tercek, it is an enormous opportunity. In this keynote speech, Tercek explains how to harness the immense power of participation to build stronger connections to key audience segments. Drawing from his experience as the producer of the highly successful online multiplayer games and the largest live seminars ever produced, Tercek reveals the keys to motivating audience engagement by providing roles and tools that direct willing participants towards constructive and purposeful interaction. Every organization that deals with end users will benefit from mastering these lessons. The profound disruption now underway in broadcast media reveals a startling truth: information is no longer subject to the old rules of the industrial economy. The collapse of Old Media is just a prelude to the massive transformation that will affect every mature business from the industrial era. An entirely new ecosystem for value creation is emerging to replace the old industrial model of markets and channels: it is dominated by companies that control the flow of data. Business leaders need a clear view of the road ahead in order to make the right strategic decisions. This talk provides a framework for strategic decision-making: the blueprint of the new information ecosystem. This speech offers startling insight into the dynamics that will affect any company that deals with information-rich products and services. THE VANISHING POINT: The Virtualization of Modern Life and What To Do About It. We are in the midst of a vast cultural change as products, businesses and even entire industries are vaporized. The transition from physical goods to virtual services is disorienting. Record shops, newspapers, travel agents, even dating have gone virtual. And many more businesses will soon follow down the rabbit hole, re-emerging as an app or a web service. Whole chunks of the consumer economy have turned into software that runs on an invisible network. Meanwhile, we’re spending more of our waking time in these virtual environments every day. Everyone has experienced this change, but few people know how to contend with it. Innovation expert Robert Tercek has the solution. In his talk “The Vanishing Point” he explains the hidden technology driving the great change, the economic impact, and he reveals the strategy for navigating this transition successfully.